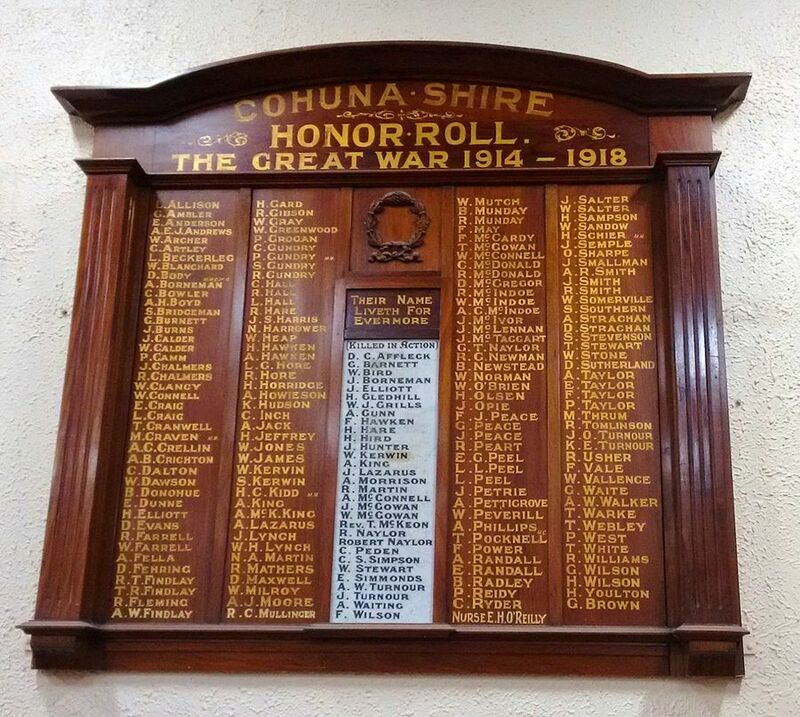 The honour roll commemorates those from the Cohuna Shire who served in World War One. Cohuna. Wednesday.— The honor roll for the shire of Cohuna, which has just been erected in the Cohuna Memorial Hall, was officially unveiled this afternoon by Major Baird, M.L.A., of Ballarat, in the presence of a crowded assembly, including hundreds of children from the State school. The board is of handsome design in polished blackwood, and contains 164 names of local men who enlisted and fought in the Great War, with an inset tablet of white marble containing the names of 31 men who made the great sacrifice. The president of the shire (Cr. Wilker) presided, and among the visitors were Mr. Henry Angus. M.L.A. : Senator Andrews, and representatives from the municipal and other associations. The function concluded with a supper in the evening at the Frantz Hotel. Age (Melbourne), 17 June 1926.